Rivers carve a passage through our landscapes with elemental force. At the same time, they can be and signify so many different things. 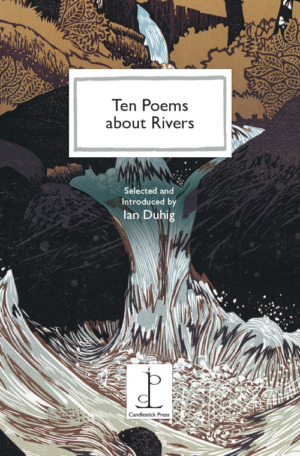 In Ian Duhig’s fascinating selection we encounter the scope and drama of rivers, from the complexity of Eavan Boland’s Liffe to Kayo Chingonyi’s turbid Tyne which prompts lovers to reflect on what brought them together. Ian Duhig is an award-winning poet who also works with artists and musicians, and on projects for the socially excluded. Poems by Eavan Boland, Kayo Chingonyi, Ian Duhig, Philip Gross, Kathleen Jamie, Zaffar Kunial, Beth McDonough, Eiléan Ní Chuilleanáin, Pascale Petit and Julian Turner. Cover illustration by Ian Phillips. Donation to The Rivers Trust. Who hasn’t looked up at the sky and seen a whale or a poodle or a sports car? The shape-shifting nature of clouds means they never fail to entertain and intrigue us. Ten poems about gardens, introduced by garden expert, TV presenter and author Monty Don. Ten Poems from Wales offers readers who are new to the poetry of Wales, and those who are already in love with it, a glimpse of a rich heritage.